Bluem publications: At BlueM we work closely with universities to study the work of our implantologist and oral surgeons. The outcome of these studies are important so that we can continually innovate and improve our products. · Makeeva, M. & Tambovtseva, N.V. 2014. Applying Toothpaste and Mouthwash BlueM in complex oral care in patients with coronary heart disease. PubMed: 18 – 20. · Berendsen, J.L.M., el Allati I., Sylva L.H., Blijdorp P.A. & Meijer G.J. A djunctive topical Reactive Oxygen Species (ROS) in periodontitis and peri-implantitis :1 – 17. · Krijnen, P.W. Healing Oxygen, Healing action applied in dentistry, Tandartspraktijk: 34 – 37. · Muts, R. 2014. Topical Oral Oxygen Therapy in practice, Tandartspraktijk: 32 – 37. · Pandya, N.V. 2015. 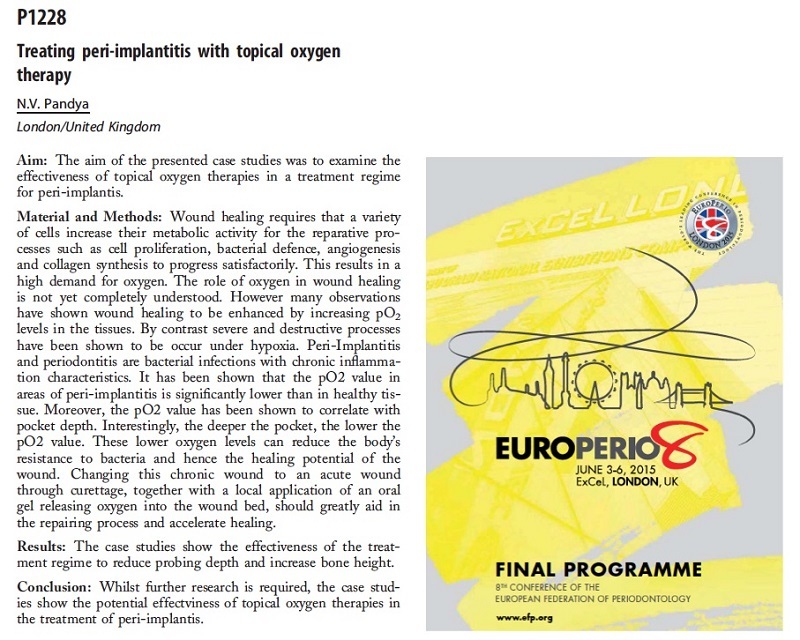 Treating peri-implantitis with topical oxygen therapy, Journal of Clinical Periodontology, 42 (S17): 441. · Schreml, S. et al. 2010. Oxygen in acute and chronic wound healing, British Journal of Dermatology: 1 – 12. · Eisenbud, D.E. 2012. Oxygen in Wound Healing; Nutrient, Antibiotic, Signaling Molecule and Therapeutic Agent, Clin Plastic Surg, 39: 293 – 310. · Pakdaman, A. Oxygen Enriched Water and Oral Oxygen Therapy: 2 – 20. · Sen, C.K. 2009. Wound Healing Essentials: Let There Be Oxygen, Wound Repair Regen, 17(1): 1 – 18. · Hopf, H.W. & Rollins, M.D. 2007. Wounds: An Overview of the Role of Oxygen, Antioxidants & Redox Signaling, 9(8): 1181 – 1192. · Nayak, P.A., Nayak, U.A., A.N. & Mythill R. 2010. Effect of Manuka honey, chlorhexidine and xylitol on the clinical levels of dental plaque, Contemporary Clinical Dentistry: 214 – 217. · Ahuja, A. & Ahuja, V. 2010. Apitherapy – A sweet approach to dental diseases – Part 1: Honey, Journal of Advances Dental Research, 1: 81 – 86. · Ahmadi-Motamayel, F., Hendi, S.S., Alikhani, M.Y. & Khamverdi, Z. 2013. Antibacterial Activity of Honey on Cariogenic Bacteria, 10(1): 10 – 15. · Eick, S., Schäfer, G., Kwieciński J., Atrott, J., Henle, T. & Pfister, W. 2014. Honey – a potential agent against Porphyromonas gingivalis: an in vitro study, BMC Oral Health, 14: 1 – 9. · Jain, A. Et al. 2015. Comparative evaluation of honey, chlorhexidine gluconate and combination of xylitol and chlorhexidine mouthwash on the clinical level of dental plaque: A 30 days randomized control trial, Perspectives in Clinical Research, 6(1): 53 – 57. · Gupta, N., Gulati, M. & Kathuria, N. 2011. Efficacy of honey to promote oral wellness, Journal of Innovative Dentistry, 1(2): 1 – 3. · Majtan, J. 2014. Honey: An immunomodulator in wound healing, Wound Repair and Regeneration, 22: 187 – 192. · Kwakman, P.H.S. et al. 2010. How honey kills bacteria, The FASEB yournal, 24: 2576 – 2582. · Nakagawa, M., Matauya, S., Shiraishi. T. & Ohta, M. 1999. Effect of Fluoride Concentration and pH on Corrosion Behavior of Titanium for Dental Use, Joural of Dental Search, 78 (9): 1568 - 1572.